"One hour to rewrite the past . . .
“It’s a really strange existence, not knowing if the person you’re talking to is physically there or not. Not knowing if you’re one hallucination away from a psychotic break.” (loc. 243) I loved the tone of this book and how it kept me captivated. From the witty sarcastic attitude of Emerson, to the suspenseful adventure that unfolds, I couldn’t help but devour this book! The first thing that really caught my attention was how I loved the way the author ended and began her chapters, and how the rhythm of this helped pull me through the book to the point where I couldn’t put it down. The only thing I didn’t like too much, as with most Young Adult genre books, is the insta-love and the potential for love triangles... or even a love square, haha. Maybe I just don’t like romance (or too much romance) in the books I read anymore. I feel like the subject, action and voice of the book made up for these drawbacks. 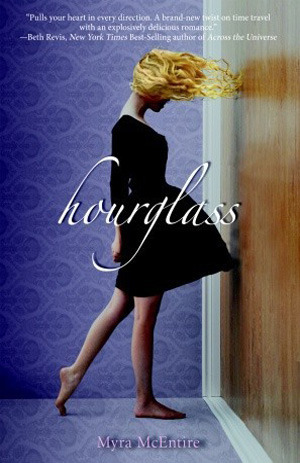 I’ve learned that I’m quite fond of books about time travel (probably stemming from my love of historical books,) and Hourglass is a great set-up for a lot to come, and I really can’t wait to read more. In all, I liked this book so much that I immediately borrowed (thanks to my library’s Overdrive website) the next in the series, Timepiece and started on it. I’m liking that so far as well! I received Infinityglass as an ARC to review, which is why I started on this series, but I’m so glad it pushed me to start because I really enjoy this series so far!